It’s easy to fall into the trap of overworking. Impending deadlines, monthly targets and competing tasks all vying for your time. 8 hour days soon turn into 14, and lunch breaks are spent scoffing down a snack and pepping yourself up with coffee or coke to get you through the rest of the day. If you’ve ever pushed yourself beyond a 60-hour week, you’ll know by the time you get to the end of it, you struggle to reach the remote while laying on the couch, let alone get the most of your free time to feel rejuvenated. It’s obvious that productivity drops when you take things to an extreme, but what is the optimal working time to be most productive? Can working less actually mean you get more done? According to a recent experiment by Draugiem Group, who run a time-tracking productivity app the optimal working time is 52 mins. As it turns out, what the most productive 10% have in common is their ability to take effective breaks. They work for 52 minutes at a time, then break for 17 minutes before getting back into it. Although just an experiment, it does coincide with a study from the University of Illinois, which verifies that your level of performance is more sustainable with small breaks in concentration. The professor of psychology at the University of Illinois, Alejandro Lleras, stated “It was amazing that performance seemed to be unimpaired by time, while for the other groups performance was so clearly dropping off”. It’s not the first indication to suggest working less or taking more breaks leads to higher productivity. In fact, multiple studies and experiments have shown this to be the case over the last decade or more. During the industrial age in the early 19th century, unions in the US and UK made a push to decrease the average working week to 40hrs. By the end of the century the 40 hour week became the norm, and not surprisingly, when businesses cut hours they also became more productive. Henry Ford famously implemented new rules in the 1920’s, which set out to improve efficiencies in his company. The rules included an eight-hour work day and a five-day work week. Coming towards the latter part of this century, the Cornell University in 1999, also found a 13% increase in accuracy when participants were notified by their computers to take a break. 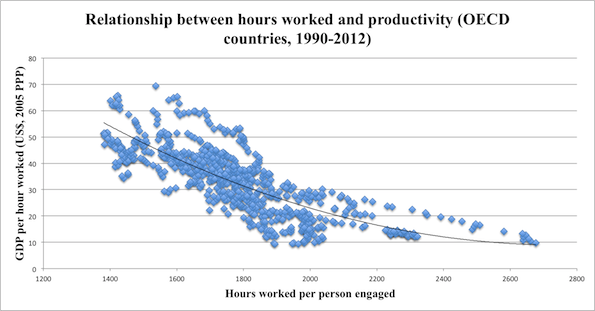 So why have we lost sight of shorter working hours? There has been one exception to the ratio of productivity, which is overtime. According to research from the Business Roundtable in the 1980’s, short-term gains were possible by briefly increasing working hours (60 or so hours for example) for a few weeks to meet a critical deadline. The very serious caveat was however, that increasing a team’s hours in the office by 50 percent (from 40 to 60 hours) does not result in a 50 percent increase in output, but in fact a 25-30 percent output due to fatigue after the initial 40 hours. Increased hours was also found to only work over a short period of time before burnout sets in. In fact, the results show that after the ‘critical deadline’ period has passed, and the 60-hour-a-week reduces back to 40-hours-a-week, burnout can take several weeks to lift before the team resumes their typical productivity level. It’s a concerning fact considering more people are taking less time off and we’re expected to work sustainably for longer, with the age of retirement on the rise and many of us working into our 70’s. One of the interesting take-away’s was that despite the Greeks being some of the most hardworking in the OECD, putting in over 2,000 hours a year on average, Germans were 70% higher in productivity, only working about 1,400 hours each year. While there’s an ever increasing push towards higher economic productivity, many of us seem to be losing sight of the fact that working long or harder doesn’t mean being more productive. Working longer hours leads to burnout, inefficiencies and a reduction in business profits, not to mention social problems for employees and communities at large. Maybe it’s time we revisited our past and realised that we should be working less, not more.